You can enter additional events later. Banquet and Pro tickets are sold separately at the R2sports site. Don’t spend an additional $20 on your entry fee later, enter today! Courtesy of the USHA – Considering how close the traditional Four-Wall dates would be to the World Championships, already slated for Minneapolis, Minn., in August, the USHA Board of Directors voted to combine the annual four-wall event with the Worlds. There were a number of factors that went into the decision, including the No. 1 reason players like to travel to the nationals: The Great Competition. The combined event will guarantee the best competition in every age and skill division at this event and likely large fields, too. The board also voted to award the nationals’ prize funds at the Worlds to make the Open events the most competitive – ever. The Worlds hosts (Life Time and Steve Johnson) are thrilled with the news and are looking for the biggest and best entry ever at this year’s Worlds. One-Wall competition begins August 9, followed by Opening Ceremonies on August 12 with Four-Wall beginning on August 13. We’re honored to host the 2018 World Handball Championships in Minnesota! Minnesota just hosted the Ryder Cup in 2016 and will host the Super Bowl in 2018. We have HUGE plans to make your visit spectacular. Make your plans now to attend the 2018 World 1-Wall and 4-Wall Handball Championships in Minneapolis, Minnesota-USA, August 9-19th. Minnesota offers the finest in dinning, theatre, concerts and every professional sport. You can take a dinner cruise on the Mississippi River or Lake Minnetonka. Visit Paisley Park, the home where Prince lived (now open for tours). It’s going to be a grand event and our planning committees are excited to welcome you in 2018! 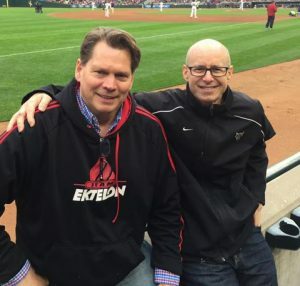 2018 World Handball hosts, Steve Johnson and John Wilinski having a planning meeting in the front row on opening day at Target Field. ​ Our ​goal is to make the 2018 World Handball Championships the most FUN EVER! Hope to see you in 2018! Departure Date: August 21- 2018. Call 612-379-8888 and ask for the 2018 World Handball Championships.